Opportunity was only supposed to survive about 90 days. A dust storm eight months ago ended its unexpectedly long life. 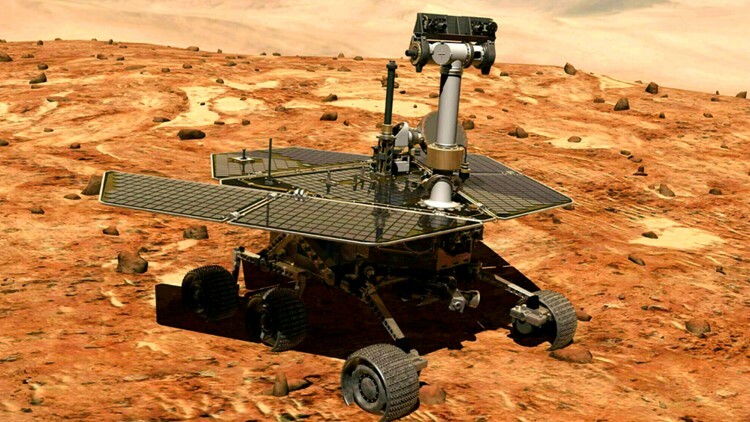 CAPE CANAVERAL, Fla. — NASA's Opportunity, the Mars rover that was built to operate for just three months but kept going and going, was pronounced dead Wednesday, 15 years after it landed on the red planet. Flight controllers tried numerous times to make contact and sent one final series of recovery commands Tuesday night along with one last wake-up song, Billie Holiday's "I'll Be Seeing You." There was no response from space, only silence. Thomas Zurbuchen, head of NASA's science missions, broke the news to members of the Opportunity team at what amounted to a wake at the space agency's Jet Propulsion Laboratory in Pasadena, California, announcing the demise of "our beloved Opportunity." Given the silence from space, "it is therefore that I'm standing here with a sense of deep appreciation and gratitude that I declare the Opportunity mission as complete," Zurbruchen told a packed auditorium. "It's an emotional time." This illustration made available by NASA shows the rover Opportunity on the surface of Mars. The golf cart-size Opportunity outlived its twin, the Spirit rover, by several years. The two slow-moving vehicles landed on opposite sides of the planet in 2004 for a mission that was meant to last 90 days. In the end, Opportunity set endurance and distance records that could stand for years, if not decades. Trundling along until communication ceased last June, Opportunity roamed a record 28 miles (45 kilometers) around Mars and worked longer than any other lander — anywhere, ever. Its greatest achievment was discovering, along with Spirit , evidence that ancient Mars had water flowing on its surface and might have been capable of sustaining microbial life. Opportunity was exploring Mars' Perseverance Valley, fittingly, when the fiercest dust storm in decades hit and contact was lost. The storm was so intense that it darkened the sky for months, preventing sunlight from reaching the rover's solar panels. When the sky finally cleared, Opportunity remained silent, its internal clock possibly so scrambled that it no longer knew when to sleep or wake up to receive commands. Flight controllers sent more than 1,000 recovery commands, all in vain. With project costs reaching about $500,000 a month, NASA decided there was no point in continuing. "This is a hard day," said project manager John Callas. "Even though it's a machine and we're saying goodbye, it's still very hard and very poignant, but we had to do that. We came to that point." He added: "It comes time to say goodbye." As it became clear the rover was about to be declared dead, NASA Administrator Jim Bridenstine said that he was encountering people "a little choked up" but that the general mood was one of celebration. Scientists consider this the end of an era, now that Opportunity and Spirit are both gone. Opportunity was the fifth of eight spacecraft to successfully land on Mars so far, all belonging to NASA. Only two remain working: the nuclear-powered Curiosity rover, prowling around since 2012, and the recently arrived InSight, which just this week placed a heat-sensing, self-hammering probe on the dusty red surface to burrow deep into the planet like a mole. Three more landers — from the U.S., China and Europe — are due to launch next year. Bridenstine said the overriding goal is to search for evidence of past or even present microbial life at Mars and find suitable locations to send astronauts, perhaps in the 2030s. "Here's, I think, an important thing to remember," Bridenstine told the AP. "There are a lot more missions to be done and there are a lot more discoveries to be made. And while it is sad that we move from one mission to the next, it's really all part of one big objective."